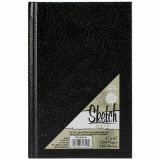 Pro Art Hard Bound Acid Free Sketch Book - PRO-ART: Hard Bound Sketch Book. This sketchbook is great for on the go art! Bring it to work, class, to the park and more and draw when inspiration strikes. This package contains one 4x6 inch sketch book with 220 white pages. Color: Black. Imported.